This blog will follow the progress of a self-directed research project generously supported by a professional development bursary (2019) from a-n. 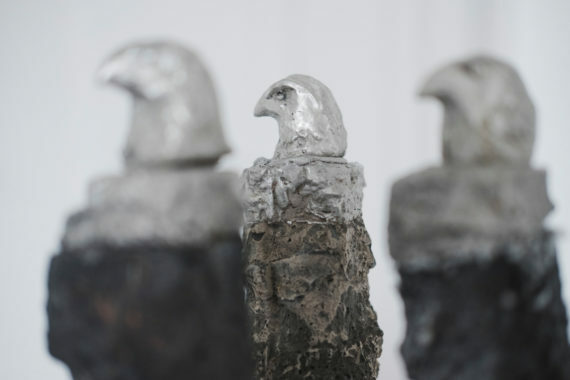 I will be working with artist Dean Melbourne (who also received a bursary) to research the areas of Jungian Psychology, alchemy and mythology. Dean and myself have a shared interest in these topics and plan to create a collaborative body of work following our research and learning. Our activity will include attending lectures at the C.G. 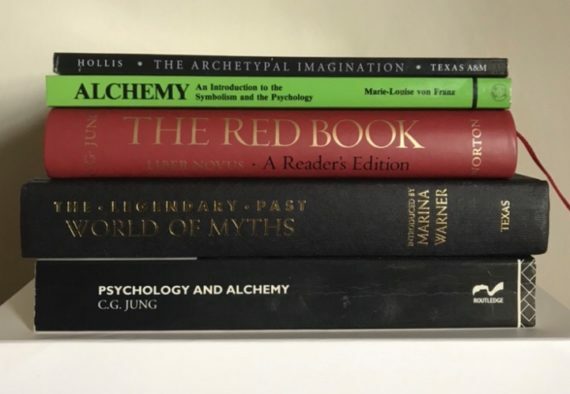 Jung club in London, engagement with the Wellcome Collection (we are leading a talk on alchemy, art and the unconscious later in the year) and, most importantly, a collaboration with a highly respected Jungian analyst. We are very privileged to have had Catherine Bygott agree to work with us. She is a Jungian analyst based in Somerset who has lectured for 25 years on Jung’s Red Book, alchemy and folktales. We are all excited to see where cultivating a dialogue between art and depth psychology leads us. Dean Melbourne and I travelled to Bruton in Somerset for our first exploratory meeting with Jungian psychoanalyst Catherine Bygott. Catherine has lectured and led numerous seminars and workshops in the UK and Ireland over the past twenty-five years on Jung’s ‘Red Book’, the structure and dynamics of the psyche, and its amplification through alchemy, fairytale and active imagination. We feel incredibly privileged to have the opportunity to listen to her expertise and to have her guide us towards integrating Jungian concepts, alchemical and mythological metaphors, and active imagination processes into our respective practices. 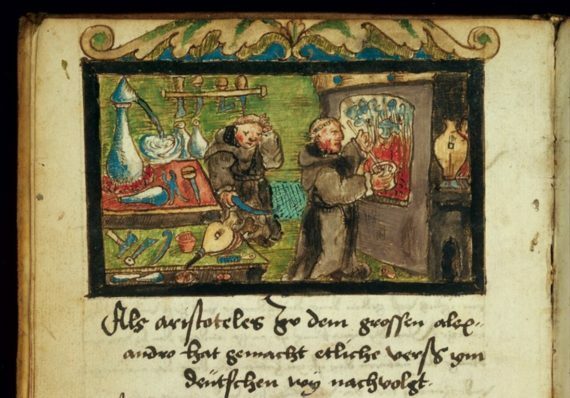 The image below shows the double face of alchemy – laboratory and library – which corresponds to Jung’s individuation process and also the artistic process. The active dialoguing with the outer world alongside the process of inner reflection. This initial meeting was largely for us to listen to each other so she could understand where we are coming from in our practices and in our personal individuation journeys and exploring how we would integrate the two using the tools of mythology and alchemy. Individuation is a Jungian process by which the personal and collective unconscious are brought into consciousness to reveal one’s whole personality. In short: it is the process of becoming self-actualized. Dean and I have been separately working with Jungian analytical therapists on our individuation journeys before looking to extend these concepts into our artistic practices. We discussed the role artists play in the collective consciousness and also the idea of not releasing work until it is “ready”. The idea of an authentic artwork first needing to do its work with the artist before being given over to the world. We made plans for our next meeting on the 3rdMay where we will continue our three way conversations and Catherine will lead us in some specific explorative exercises around our topics of interest. 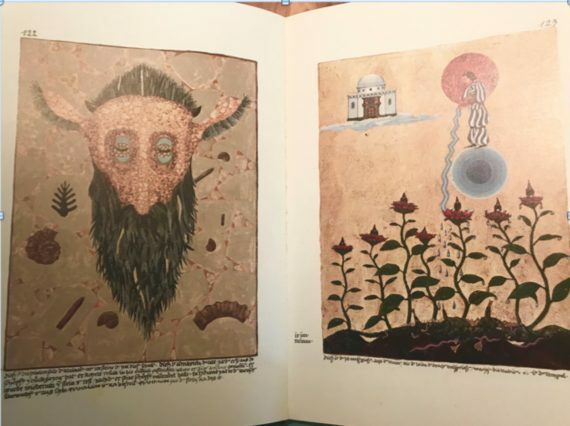 Our research project started with two days at The Wellcome Collection in London exploring their wonderful resources on alchemy and Jung. There were two areas we were interested in – the Wellcome Collection library and the Reading Room resource. I’ll share a little about both. 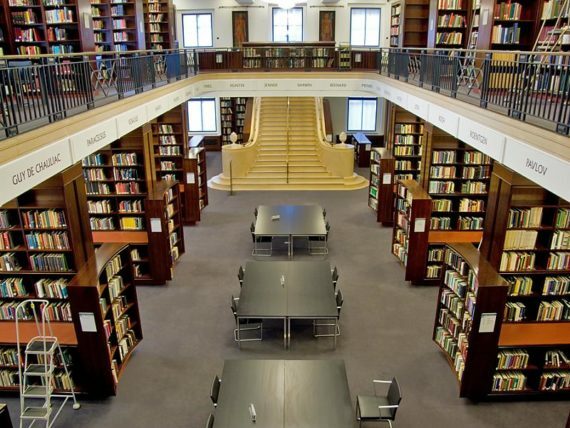 The Library has over 750 000 books and journals, an extensive range of manuscripts, archives and films, and more than 250 000 paintings, prints and drawing. You can use the Library for the day by signing in as a day visitor at the Library Admissions Desk. 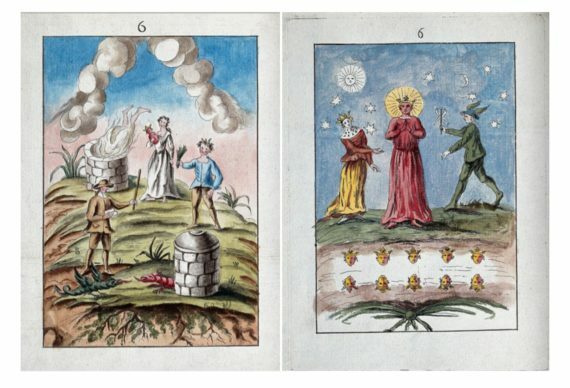 We visited the section on alchemy and got to indulge in books full of evocative symbols and metaphors. What is truly exciting is the collection archive – manuscripts from the 3rdcentury onwards including medieval treasures. 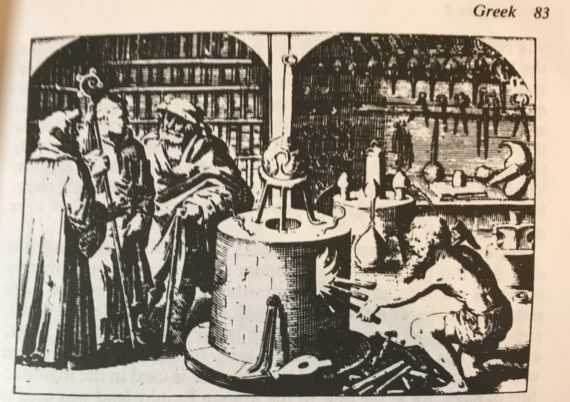 You can search by subject – in our case “alchemy” – view the archives online and then request for a manuscript to be bought for viewing. To do this you need to become a library member but its straightforward to do, just need photo id and fill in some forms. The Reading Room at the Wellcome collection is a relaxed space for anyone to come and meet, read and be inspired. Its divided into themed sections such as “mind”, breath” and “alchemy” with relevant books and objects from the collection in each. 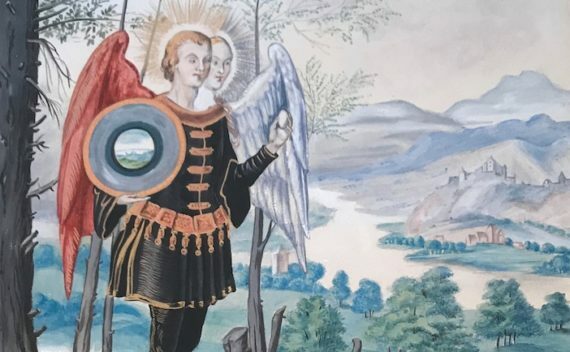 The Alchemy nook has a replica of the Ripley Scroll, a copy of Jung’s Red Book, paintings depicting alchemy on the walls, and books on Jungian psychology and alchemy. 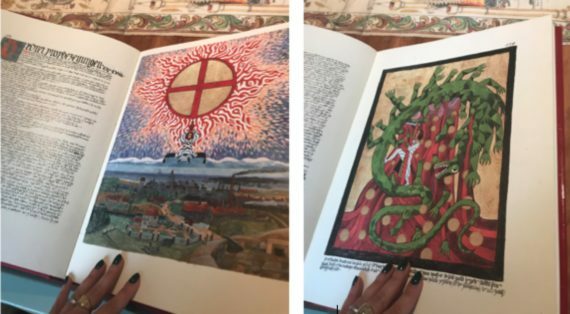 I have a readers edition of Jung’s Red Book at home but it is text only so it was wonderful to see and reflect on Jung’s painting’s in the larger illustrated copy. On our second day in London we met with the events officer of the Wellcome trust – Valerie Brown and arts producer/consultant Elizabeth Lynch to make plans for a talk we will deliver later in the year sharing the learning from our project. 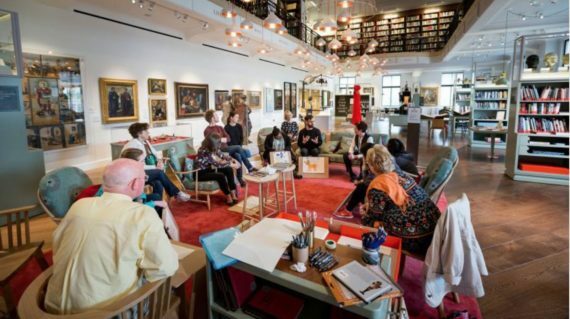 We attended a workshop where Elizabeth shared her experience of working with public groups in settings such as the Wellcome Collection and we spent some time thinking how we would make our learning accessible there. 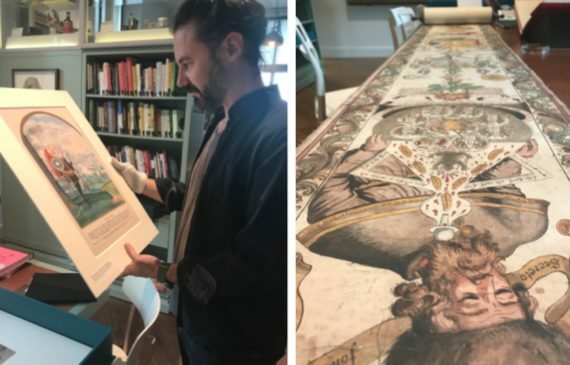 Our talk on art, alchemy and the unconscious will be part of the Reading Room’s Open Plaform forum. 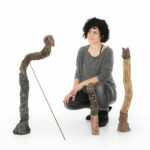 Living in a rural area on West Dorset’s Jurassic coast, Chantal Powell creates sculptural works about the unseen aspects of our psyche. A PhD in social psychology and an interest in Jungian theory inform her practice. She is the founder of the contemporary arts program Hogchester Arts.